I’ve always had a soft spot in my heart for tofu, and I’ve always heard that Vit Goal (near 54/55) serves really authentic Korean tofu soup. So I’m happy to (FINALLY) present this review for my Vit Goal experience! S and I wanted to try more than just the tofu soup, so we ordered the “Special for Two”: choice of tofu soup and grilled sliced beef (bulgolgi). (You can also choose beef short ribs, which looked equally delicious.) For the tofu soup, we picked the tripe and asked for medium spicy. As for our main dishes? The tofu soup was delicious, as expected, although the tripe was a bit of a surprise. It wasn’t like anything I had encountered in Chinese or Vietnamese cuisine (well, pho). Either they used a different portion of tripe, or tripe means something else at Vit Goal.. nevertheless it was ok. 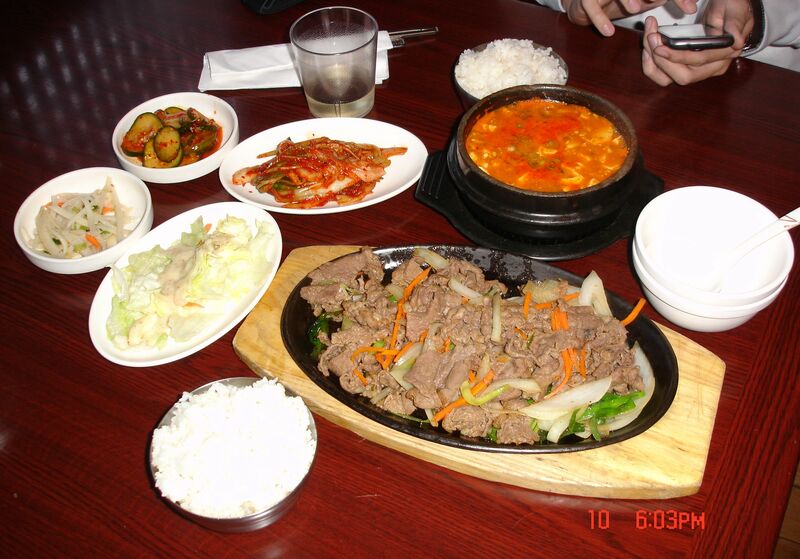 The bulgogi was really good, though. The flavor was really good – hints of sweetness along with the savory. I’m thinking aji-mirin (a type of sweet rice wine used in Asian cooking) was used to achieve this? Nevertheless, it was delicious. So overall, a really pleasant experience. We left pretty stuffed (the portions are larger than you think..) and satisfied. The Combo dinner cost around $24, which was pretty reasonable, I think, for that much food. If you’re there with just another person, I’d definitely recommend this option since you get to try not only the tofu soup but also another specialty on the menu.